Sami Khedira set for Bayern Munich move? Marca reported German giants Bayern Munich have also entered the race to sign the World Cup winner Sami Khedira as the midfielder struggles in Spain. Marca reported German giants Bayern Munich have entered the race to sign the World Cup winner Sami Khedira as the midfielder struggles in Spain. The reports have already linked Sami Khedira to several clubs including Arsenal and Chelsea and now they have come up with Bayern Munich who are now planning to bring him back to his homeland. The Bundesliga Champions who sold their star midfielder Toni Kroos to Real Madrid in the summer are hoping to beat Arsenal for the signature of Sami Khedira. The German side are in no urgency of a midfielder, they signed Xabi Alonso from Real Madrid and he is performing very well. 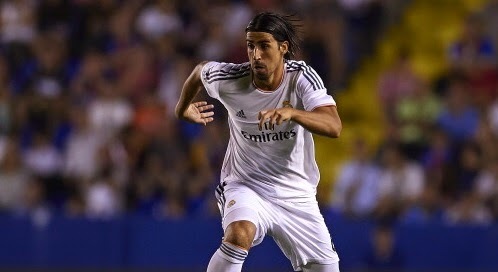 But Pep Guardiola is keeping tabs on Khedira’s situation as he is not signing a new deal at the Santiago Bernabeu. The 27-year-old has struggled for playing time this season despite of Luka Modric's injury. Madrid have offered him a contract extension but the German is not ready to sign any deal. He has made only four appearances in La Liga so far this season. With Bayern Munich in the race means Arsenal would be looking for other targets. Arsene Wenger have already shortlisted many names for that role including Newcastle midfielder Moussa Sissoko.